Make a one-time donation to the Museum of Florida History online! Donations provide essential, ongoing support that helps the Museum meet its mission. Donations are made through the Florida History Shop and will be used to support programs, exhibits, collections, and activities of the Museum of Florida History. Celebrate the symbols of Florida with the 2018 Official Florida Christmas Ornament. This antiqued brass ornament depicts the current State Seal, which was adopted in 1985. The Seal features the sunâ€™s rays over a steamboat on the water, a sabal palm tree, and a Seminole woman spreading flowers. These symbols have been featured on the Florida State Seal for over 100 years and have been updated for historical accuracy. Florida's History Shop specializes in Florida-themed gifts; an outstanding selection of books, art, apparel including Florida ties and jewelry, toys, games, postcards, and other souvenirs. 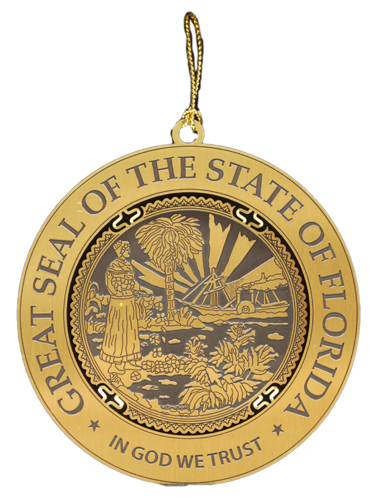 Many products including those with the State Seal of Florida are exclusively ours. Shop at one of our three locations or place your order in one of five easy ways. Major credit cards accepted. Select a Category to begin Shopping!